Turns out, sea urchins lack eyes. But the purpose is solved by another of their body part – tentacle-like tube feet. According to a new study conducted by the Lund University, while sea urchins have fairly low-resolution vision – it is good enough to fulfill their basic needs. “Sea urchins are currently the only animals that have been shown to see without having eyes. They see using light-sensitive cells in their tube feet, which resemble tentacles and, like the spines, are all over the body. You could say that the entire sea urchin is one single compound eye”, said John Kirwan, who conducted the study as a part of his doctoral thesis. “Ordinarily, sea urchins move towards dark areas in order to seek cover. When I notice that they react to certain sizes of images but not to others, I get a measurement of their visual acuity”, explained John Kirwan. 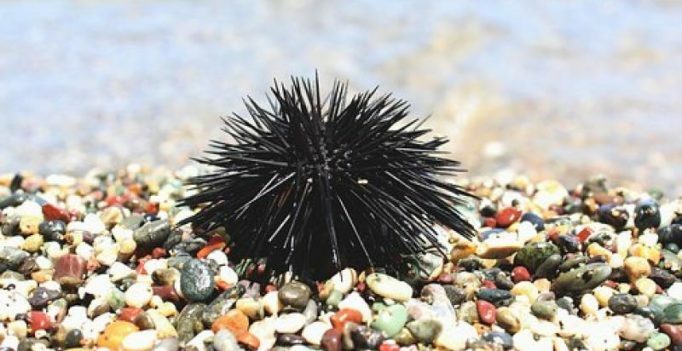 John Kirwan’s calculations showed that of the 360 degrees surrounding the sea urchin an object must take up between 30 and 70 degrees for the sea urchin to see it. Humans only need an object to take up 0.02 degrees in order to detect it, making it clear that their eyesight is poor in comparison with human eyesight. “However, this is still sufficient for the animal’s needs and behaviour. After all, it’s hardly poor eyesight for an animal with no eyes,” John Kirwan concluded.